The gantt graph scrollbar was adapted on the browser size. Link between tasks in gantt (project to tasks). The plugin was configured for Odoo v8.0. Is this available for Ver 9 ? please, how to get is upgraded to Odoo 9? Thank you for your work, it's great that you are working on that module. 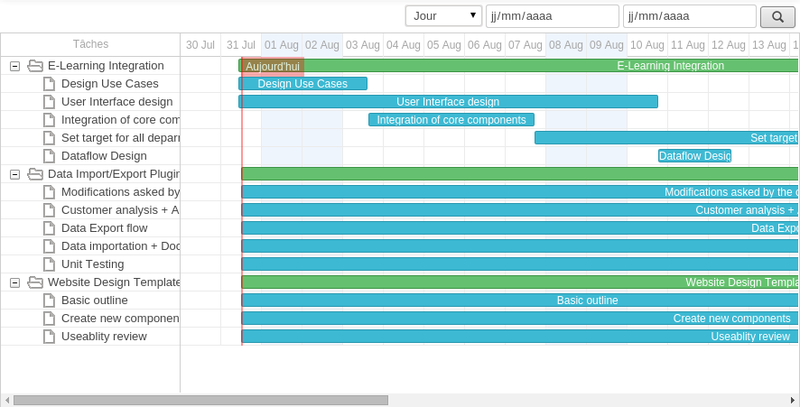 It's the best alternative for standard gantt view I have seen. But, plugin have some bugs, and if You could fix that it would be great. 1. In Manufacturing -> "Work orders by resource", when i change group by Work Center, timelines for Work orders increase (example from few hours to few days ?) 2. In "Work orders by resource" when trying to move job, get error that document has been deleted, try to refresh. 3. When double click on job in "work orders by resource", detailed view opens fiew times, but can work with that. So if You culd fix that, it culd be the best alternative for the generic view. Thanks. Some usability issues - double clicking on a task opens multiple form views, toggling from GANTT to tree adds an additional CREATE button. Very good though!